Caledonian Road, Islington, was opened in 1855, by the late Prince Consort. It was designed by Mr. Bunning, the City architect; cost nearly 500,000l., and occupies seventy- - four acres within the walls. The average weekly sale of beasts in this monster live-stock emporium is 25,000 sheep and 5000 oxen, besides calves, pigs, &c. There are "pens" here for 34,890 sheep; bullock-posts for 6616 beasts; two taverns on the north side of the market, public- houses at each corner, twelve banking-houses, and en electric telegraph office, open only on market-days, ranged around the clock-tower. All sales are for cash. Copenhagen Fields.—This the great cattle market of London lies up the Caledonian-road, King's-cross. At a mile and a quarter from King's-cross Market-street is reached, and then turning to the left, in a hundred yards or so the visitor finds himself at the great gates of the cattle-market. The market is of immense size, but large as it is, it is insufficient to contain the animals sent up for the Christmas markets. In the centre is a clock tower, round which are the offices of the market clerk and other officials. On one side is the cattle-market, upon the other the sheep-pens. The calves are for the most part under roofs with open sides, and the pigs have also their own portion of the market. The number of cattle and sheep sold here weekly is prodigious, and the arrangements are excellent both as regards regularity, and, as far as possible, the comfort of the animals. Although upon some days of the week the number of beasts is much larger than at others, there are always a good many there, and a visitor pressed for time can therefore choose his own day. NEAREST Railway Stations, Barnsbury and Holloway; Omnibus Routes, Camden, Caledonian and Holloway roads. CATTLE MARKET, CAMDEN TOWN ... This extensive market, with its various buildings, covers an area of thirty acres. On market days, Mondays and Thursdays, it presents a very animated scene, it being estimated that upwards of four millions of animals are sold here annually. 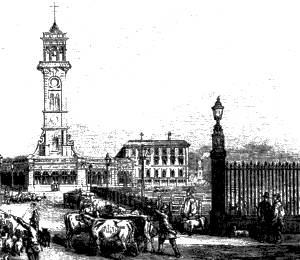 THE CATTLE MARKET, Caledonian Road, King's Cross, is an immense emporium for the sale of sheep, cows, pigs, and calves, formerly held in Smithfield. The market days are Mondays and Thursdays, and great numbers of animals are exhibited for sale, especially on Mondays, when they sometimes number over 15,700. In the centre of the market is a clock tower, around which are the offices of the clerk and other officials.